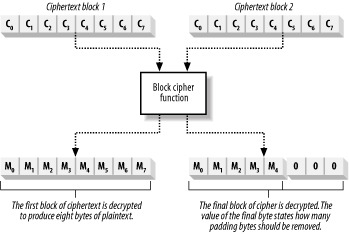 Padding, unlike other aspects of encryption, is expressed in bytes rather than bits. For example, if you are using a cipher that processes 64-bit blocks, a 13-byte (104-bit) message breaks down into one complete data block with 40 bits remaining. We need to add 3 bytes (24 bits) of data to the remainder to create a second block that the cipher function can process. There are two commonly used approaches to block padding, and the .NET Framework supports both. The first approach is simply to set the remaining bytes to 0, as shown in Figure 8. 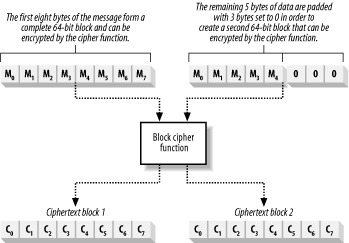 Encrypt the padded plaintext block, and the result is appended to the ciphertext; note that the ciphertext will be three bytes larger than the plaintext. When you decrypt the ciphertext, remove the padding values to return to the original plaintext message. The problem with this approach is that it is difficult to be sure that you are removing the padding correctly; some algorithms naturally generate strings of zeros, and you may remove bytes that are part of the message. A more reliable approach is to use PKCS #7 padding, where you set the value of the padding bytes to the number of bytes you added. For our example, the padding would be three bytes set to a value of "3". When you remove the padding, simply read the value of the last byte and you can tell which bytes you have to remove, as shown in Figure 9. You still have to add PKCS #7 padding even when there are no partial plaintext blocks to process. This is because many algorithm implementations examine the numeric value of the last byte, and do not check to ensure that all of the padding bytes are set to the same value. When the plaintext results in only whole blocks, add a complete block of padding data, with all of the byte values set to be 1/8th of the block size; for a 64-bit block cipher, this would be 8 bytes of value "8". When the ciphertext is decrypted, remove the entire final block to leave the original plaintext. PKCS #7 padding is limited to 256 bytes of padding, which is the largest numeric value a single byte of data can represent. The security of symmetric encryption comes from the fact that Eve does not have the secret key. If she did, she would be able to read any of Alice's messages to Bob and even forge new messages by using the secret key to encrypt them. We describe secret keys by their length, measured in bits. A 64-bit key can represent 264 different key values, and a 256-bit key can represent 2256 different key values. Symmetric encryption keys are typically attacked using brute force, where Eve tries all of the possible keys until she finds the one that Alice and Bob have selected. Protect the confidential messages by making it hard for Eve to try all of the possible keys; the longer you make the key, the longer it takes Eve to check all of the possible key values. Alice and Bob select the secret key randomly, and Eve has no information that would lead her to suspect that checking a specific range of keys is more likely to yield a result than any other range. Eve will have to check all of the possible key values before she finds the correct one. If you consider these assumptions, you will notice that there is a fundamental conflict. For a randomly selected key, Eve may be lucky and find that the first key that she checks is the one that she is looking for. It will take Eve 11.6 billion years to try all the possible values for a 64-bit key if she can test 50 keys per second, but there is a 50% chance that she will find a match after checking only half the key space and a 1 in 264 chance that the first key she checks will be the one that Alice and Bob have used. When assessing the security of keys, always bear in mind that brute force attacks are subject to the laws of probability, and it's a very optimistic expectation to hope that Eve will have to check all possible keys. If Eve knows that the key is contained in a specific range, then the situation is even worse: not only is early success still possible but she is also able to reduce the total number of keys to check. Assess the length of the key you need by estimating how many candidate keys Eve can test per second then compare this with how long you need to maintain confidentiality. For example, if Eve could check 50 candidate keys per second, it would take her 11.6 billion years to check all of the possible values for a 64-bit key. If Eve checks more keys per second, then you will have to adjust your projections accordingly. The trade-off is that encrypting and decrypting data using longer keys requires more computation, and using very long keys is practical only when you are using high-end computers. Make a reasonable estimate of your confidentiality requirements when selecting a key length and include an estimation of how Eve's ability to perform brute force attacks will change over time. History shows us that improvements in design and manufacturing halve the cost of processing power every 18 months; therefore, over time Eve will be able to increase her ability to check candidate keys for each dollar that she spends. The .NET Framework provides classes for four different symmetric encryptions. Table 1 summarizes the encryption algorithms available and the possible secret key lengths. Based on the Lucifer cipher developed by IBM, the Data Encryption Standard (DES) algorithm was published in 1976 and has been used in a huge range of applications. The design has aged remarkably well, given it's rocky beginnings. To produce DES, the National Security Agency modified the Lucifer cipher in a way that was thought to compromise security. (A common theory throughout recent cryptographic history is that the National Security Agency is tinkering behind the scenes to limit the efficacy of cryptography.) The limit of a 56-bit key means that DES is becoming increasingly susceptible to exhaustive key searches using modern computers, but various efforts have been made to prolong the life of this venerable cipher, most notably the Triple-DES standard. The Advanced Encryption Standard (AES) officially succeeded DES in 2001 as the principal U.S. federal standard for data encryption. The RC2 algorithm was developed by Ron Rivest of RSA as a direct replacement for DES. Controversy dogged the acceptance of RC2, because RSA decided to keep the details of the cipher secret, preventing proper security analysis. In 1997, RSA published the details of the algorithm to foster the adoption of the S/MIME standard, which acts as a framework for cryptographically secure email. A wide range of products use RC2, and it has become one of the most commonly used symmetrical ciphers. RC2 operates with key lengths ranging from 40 to 128 bits. Designed to prolong the life of DES, Triple-DES encrypts data three times using the DES algorithm. A different 56-bit key can be used for each encryption step, or two 56-bit keys can be used and the third encryption step will be performed using the first key. Triple-DES has found a lasting niche in the international financial markets for encrypting banking data. Rijndael (pronounced "RAIN-Dahl" or "REIN-Daal") was the winner of the U.S. Government's selection process for the AES, which is the successor to the aging DES algorithm. Unlike the other algorithms included in the .NET Framework, the Rijndael cipher function operates on a range of data block sizes. Although tested rigorously during selection, cryptographers have not yet established the long-term security of the Rijndael/AES algorithm. You should exercise caution before using Rijndael, and remember that it takes a great deal of time and analysis before a new algorithm can be fully trusted.